Finally, we came to the halfway point of my trip. Not just halfway point, but it is perhaps the highlight of the journey too. 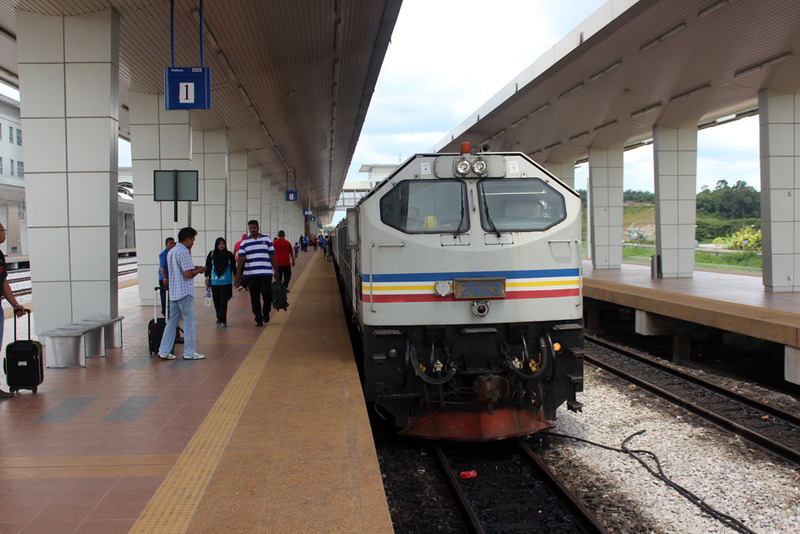 Because unlike my previous Malaysia trip, this one features return train trip. Okay, after an enjoyable sleep in my hotel, we woke up and took a breakfast in the hotel’s restaurant. It is the only hotel throughout our stay that provides breakfast. The meal buffet might not be really impressive, in fact I tasted the worst type of hash brown in here, but at least it is inclusive of hotel rate. After we finished our breakfast, we returned back to our room to have shower and packing up our belongings. 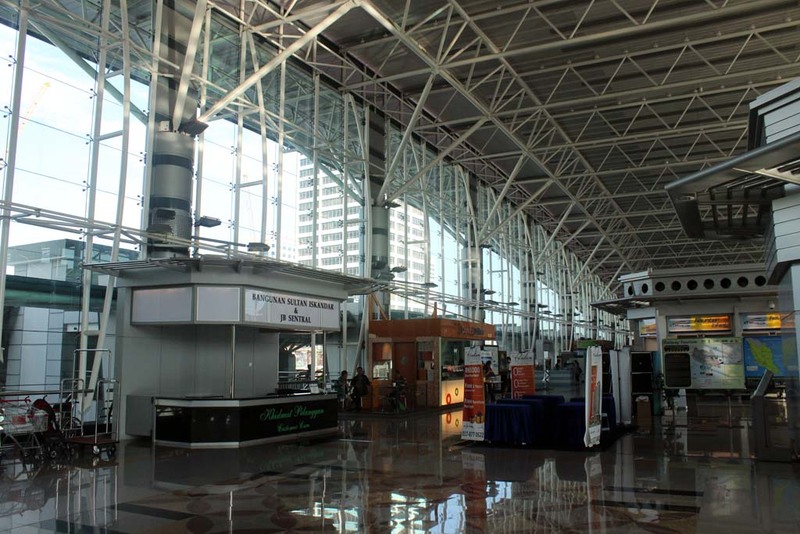 We checked out from our hotel soon after and heading to JB Sentral station. Since the station is just within walking distance, we didn’t need to hail taxi. 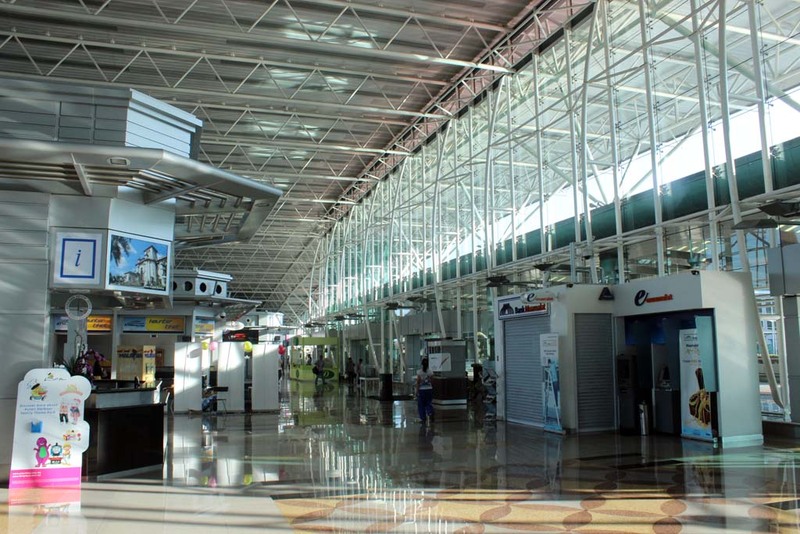 All shopping outlets around the area are still closed. 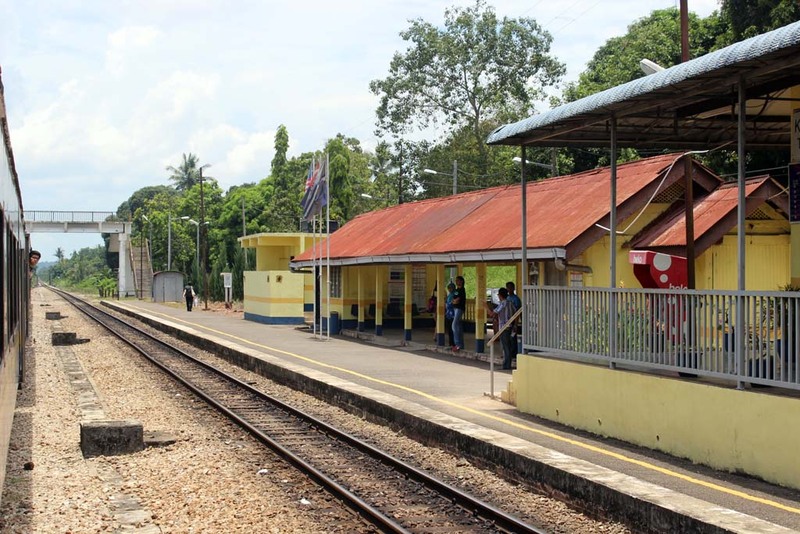 Even when we arrived at the station, most of them are still closed. 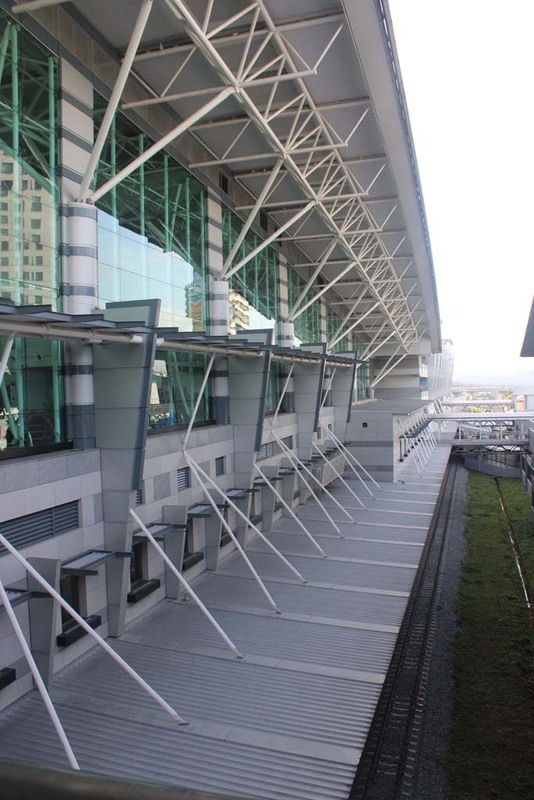 Somehow, I really admiring the architectural style of JB Sentral station. 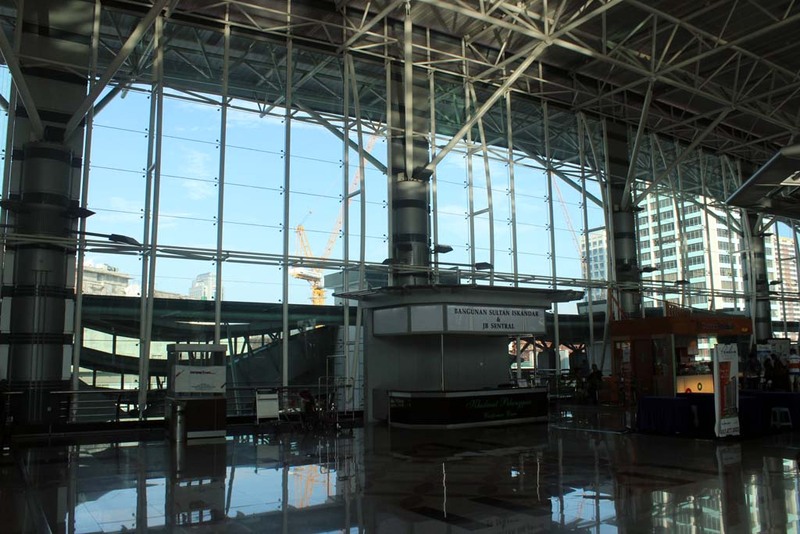 It reminds me of KL Sentral when it was brand new, back in 2004. The question is, how long will it be in this state of cleanliness? 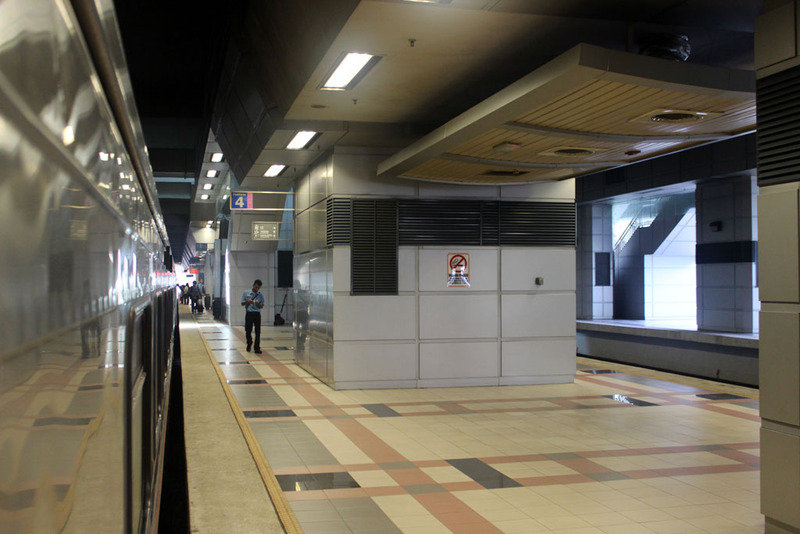 Even KL Sentral is now already showing sign of decay. 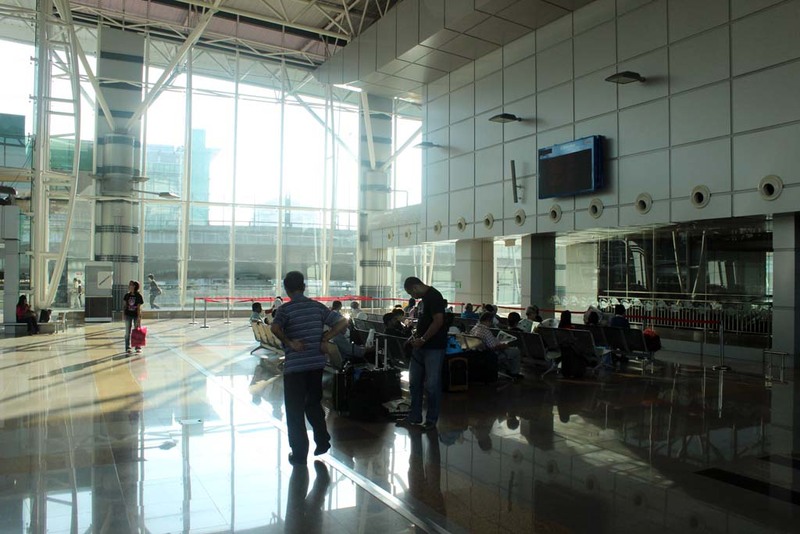 We went to the waiting lounge, which is more like a row of seats in one corner of the hall, near the platform entrance door. Although we already have breakfast, I decided to purchase some Nasi Lemak at nearby food stall just in case if we got hungry again along the way. 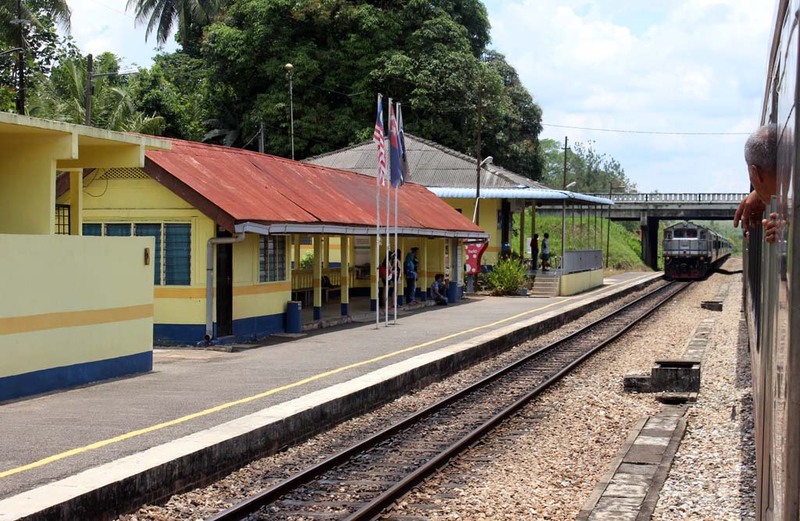 After I bought the Nasi Lemak, I took a quick snap of the station’s exterior. You could see parts of the track underneath. 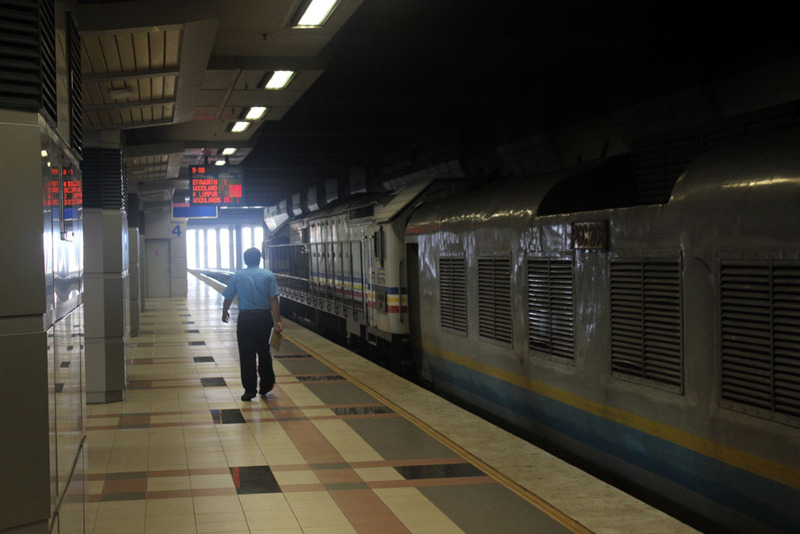 Not long afterward, the announcer asked the passengers to board the Express Rakyat train on the platform underneath. “Back to reality” moment, or back to the seater train again! After I found my seat, I made a brief look at our locomotive. Well….surprise! It is a Blue Tiger! 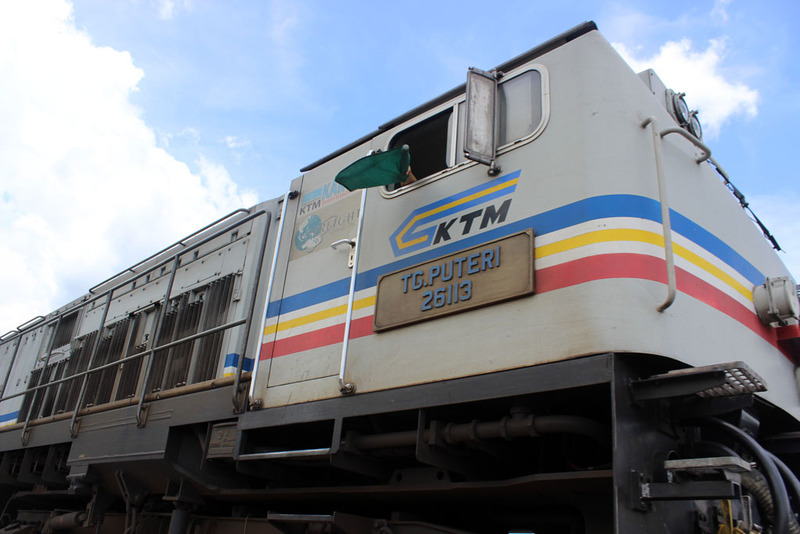 Blue Tiger is my favorite Malaysian locomotive, and this is the first time that my train is hauled by Blue Tiger. 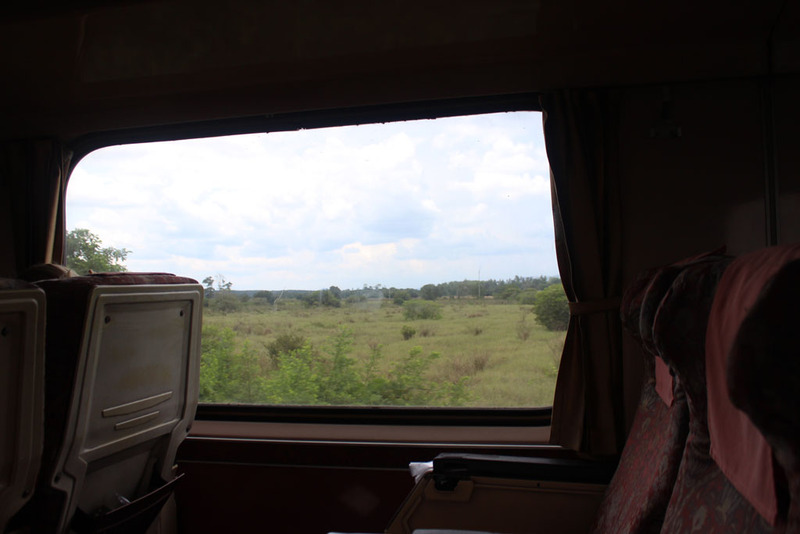 Since I don’t want to repeat the same incident on the previous journey, I decided to stay safe, taking picture from the coach door. 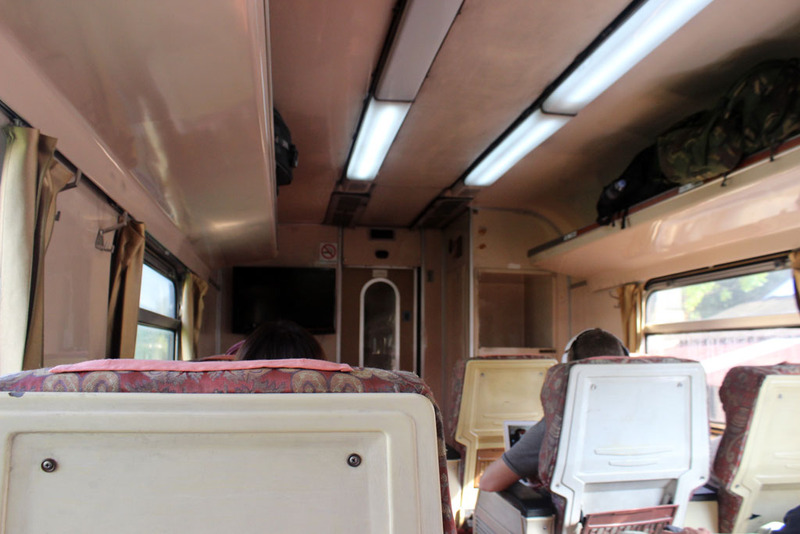 This is the interior of my coach. I sat on the seat with the bag. 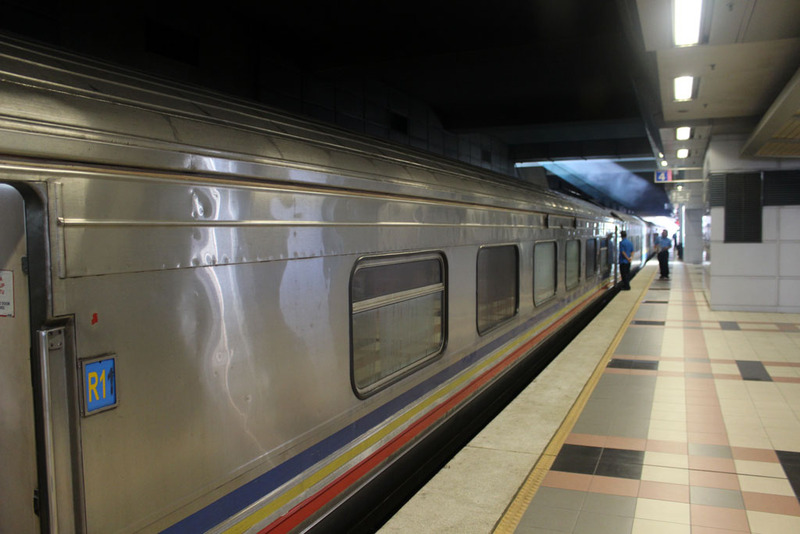 We soon departed from JB Sentral. 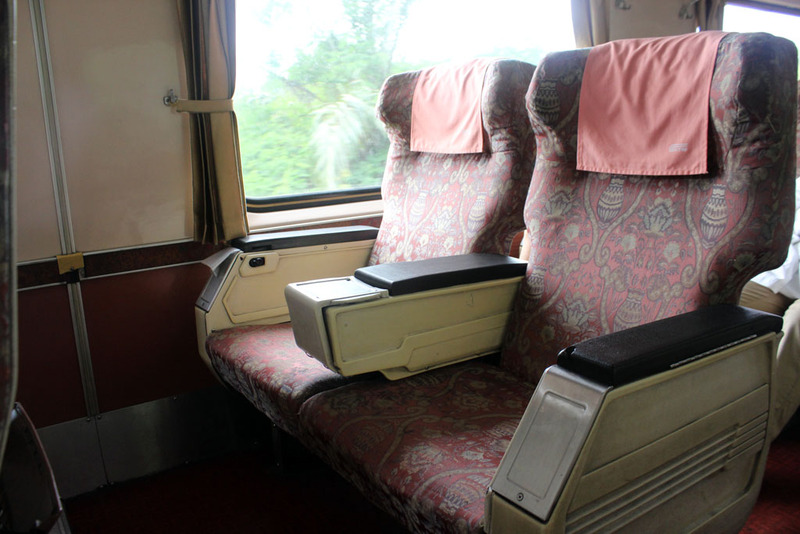 Although there is a TV in front, they never turned that on, making the journey rather bland for those who don’t bring their own entertainment. 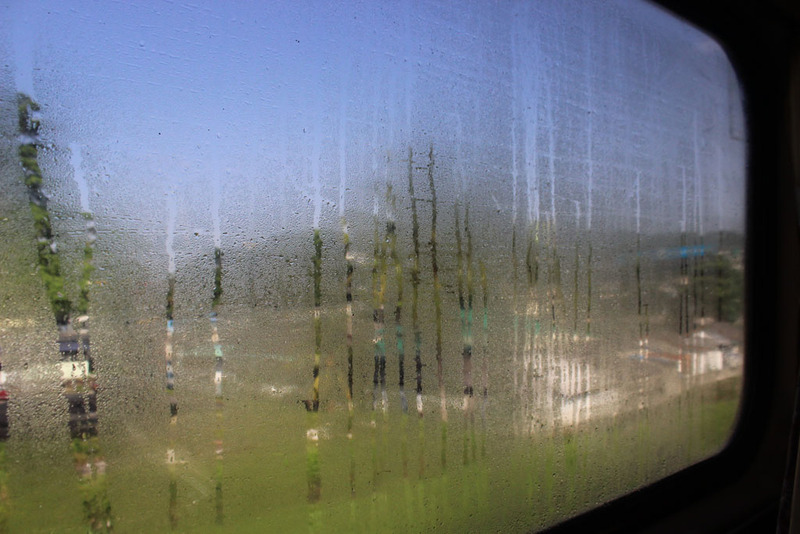 Unfortunately, during a few minutes at the beginning of the journey, my window is covered in moisture from Aircon system. However, a few minutes later, it cleared. 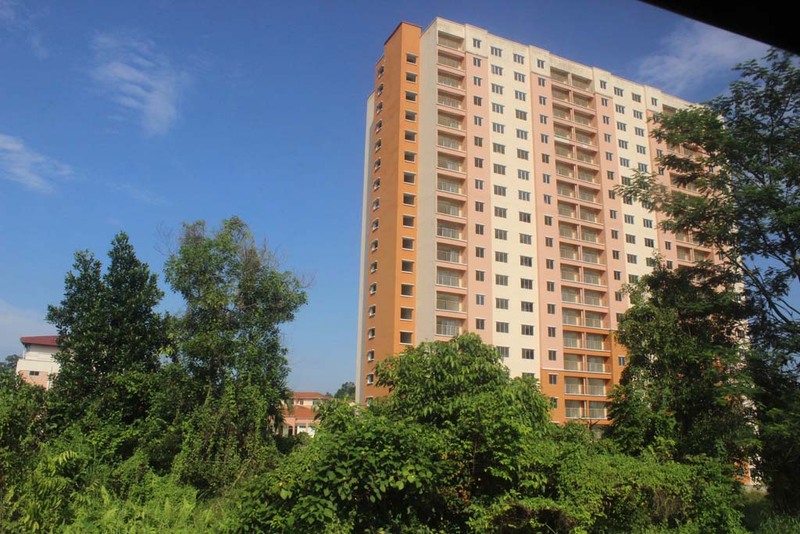 Just before we arrived at Kempas Bahru, I spotted this scenic place. 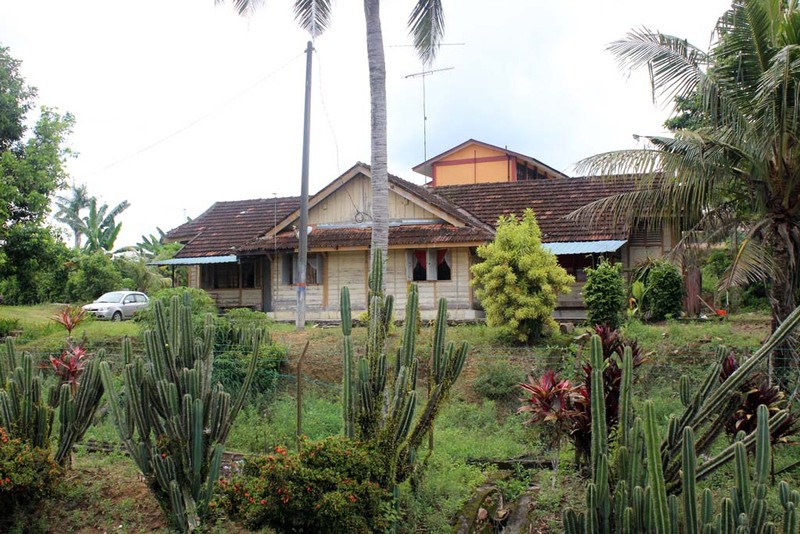 I wonder if this place is safer and more accessible than Batu Anam savannah? 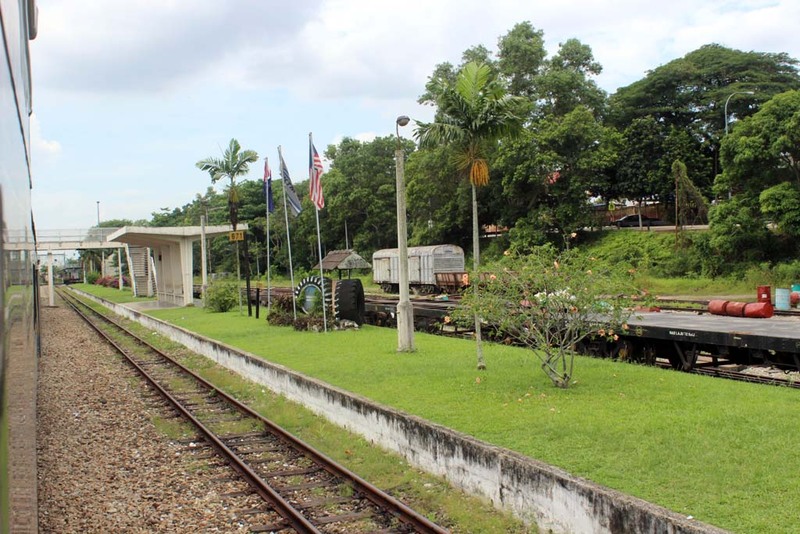 Kempas is also a junction station, where the branchline from Pasir Gudang merged with the mainline. 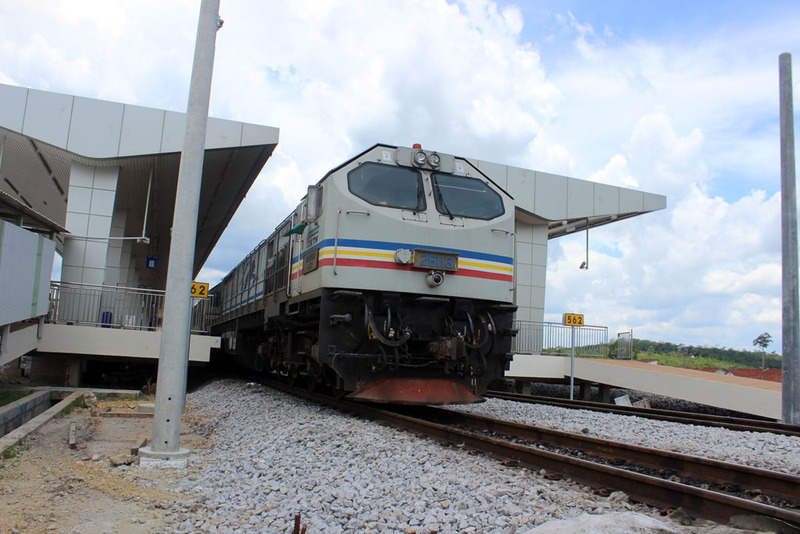 Once my train arrived at Kempas Bahru, I finally able to meet the “host” or the local railfans in Johor: my old friend Johari and new one Faeez ( I previously know him by his Facebook username: “Putera Sulong”). 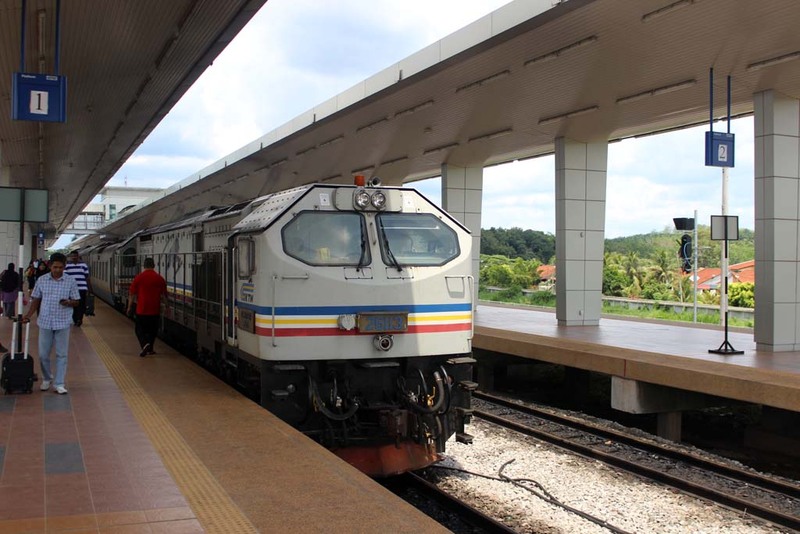 This is the first time I met Faeez, and this is also the second time I visited Kempas Bahru station with Johari, although this time I am the train passenger. 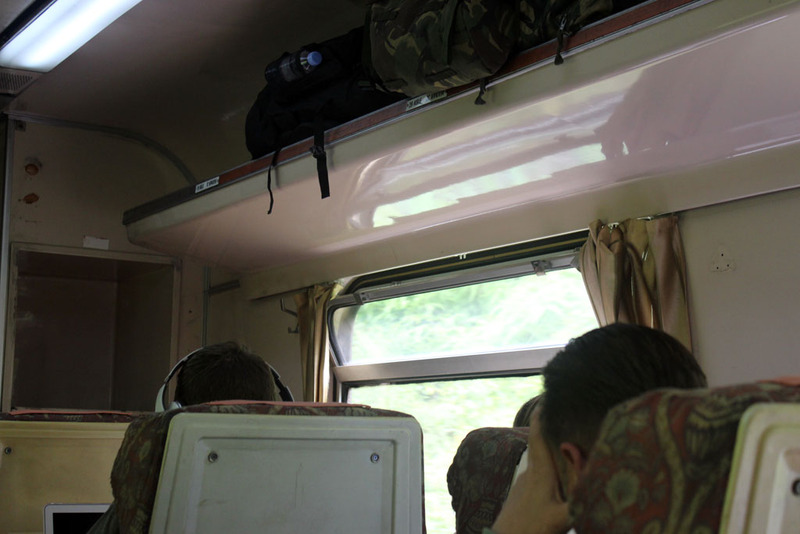 We talked a lot during my train’s stopover. Apparently, our train stopped longer than it should be. 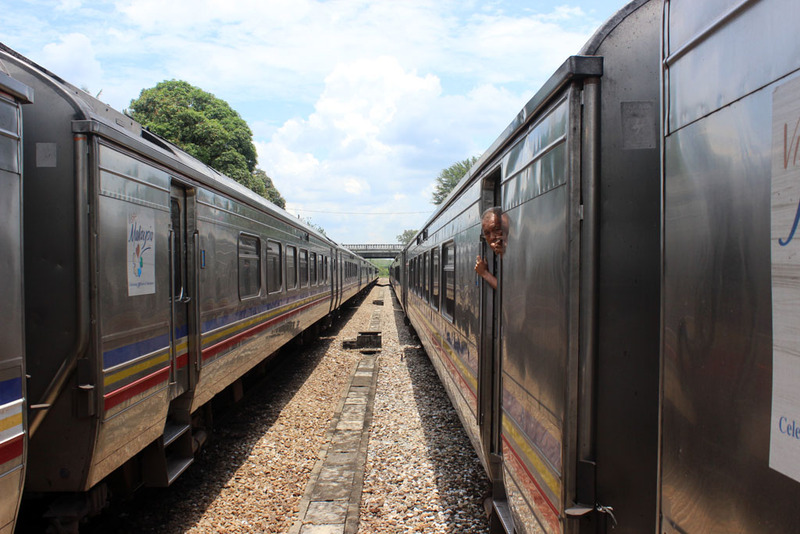 So we manage to go in front of the train. 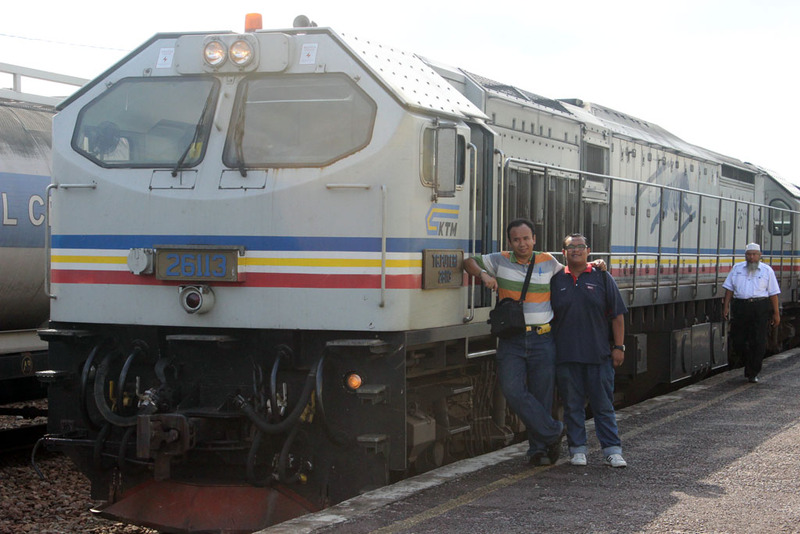 I also took the opportunity to take picture in front of the loco. Apparently there is a problem with the brake pipes. I didn’t remember what was exactly happened, but our train was delayed for almost an hour. 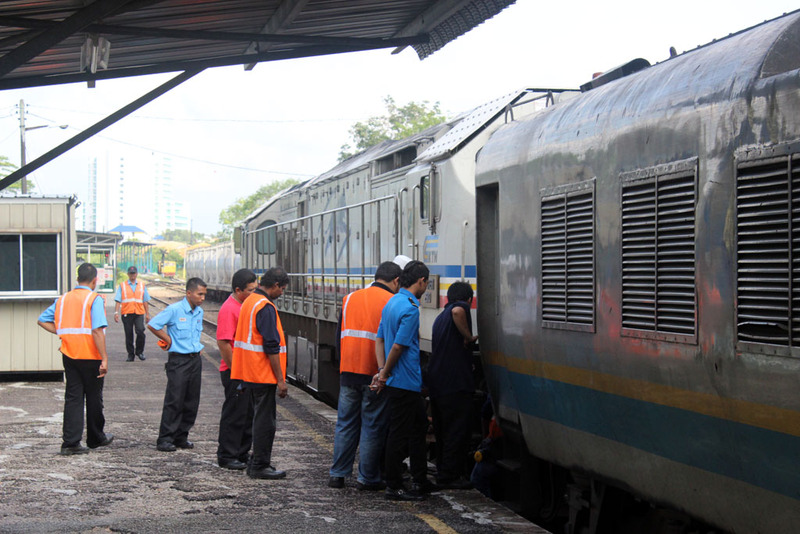 Once they rectify the problem, our train resumed its journey. And I bade farewell to my Johor friends. 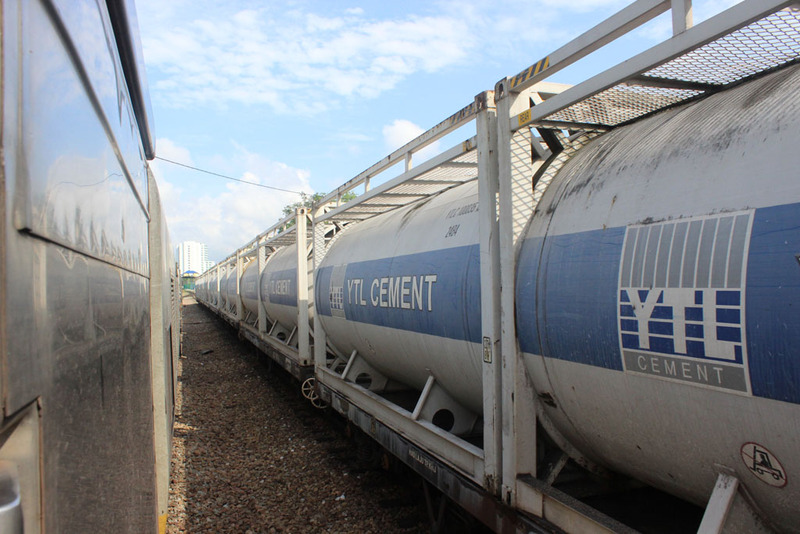 When our train cleared the cement train, I realize that there are some locomotives in the yard. The journey was a nice and smooth one. I have to say the air conditioning is strong and powerful. Some much that it even still felt cool inside despite the fact that someone opened the window. Unlike my Singapore-bound journey, this time the train is not packed. There are some empty seats. 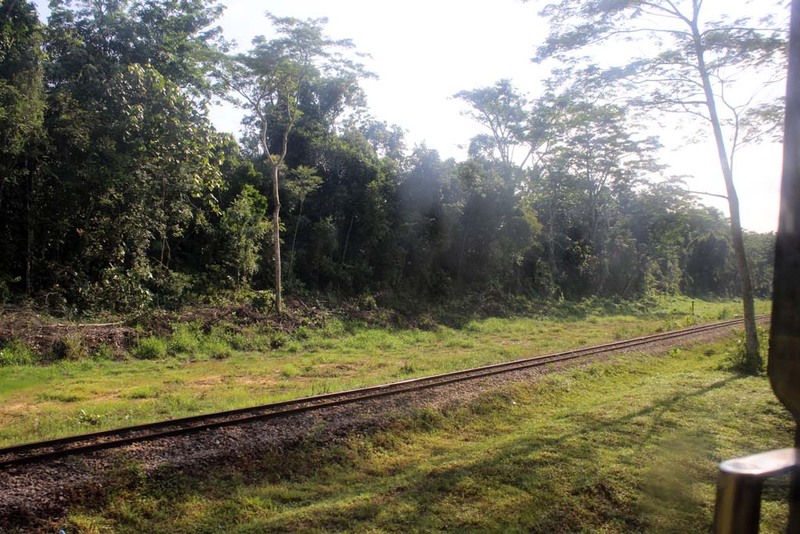 I didn’t sleep much, so I took some scenery along the tracks. 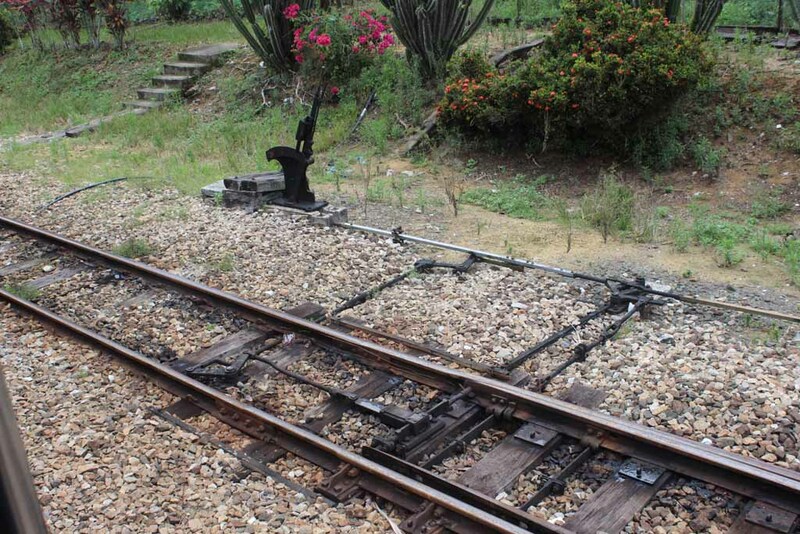 Some station still employing this old style point for their siding. I don’t remember what station is this one. 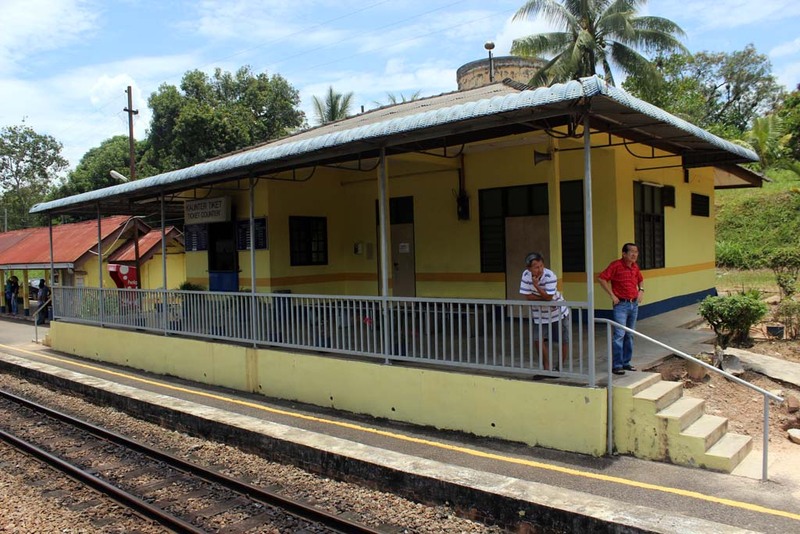 But the platform room looks like a 1950s structure. 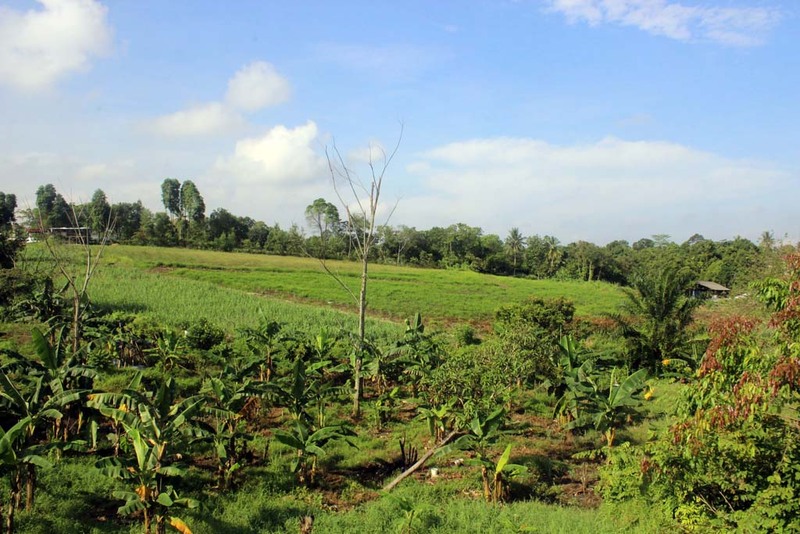 The scenery along the way is dominated with palm plantation. So I don’t take many photos. 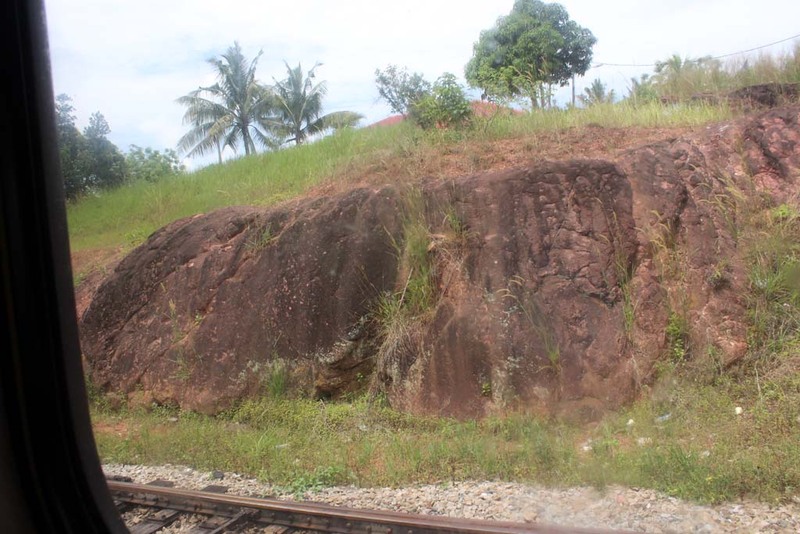 However, there is one unusual sight as our train stopped at Paloh station: a huge chunk of rock. The rock itself resemble a volcanic rock, which is unusual, considering that there are no volcano in Peninsular Malayisa. 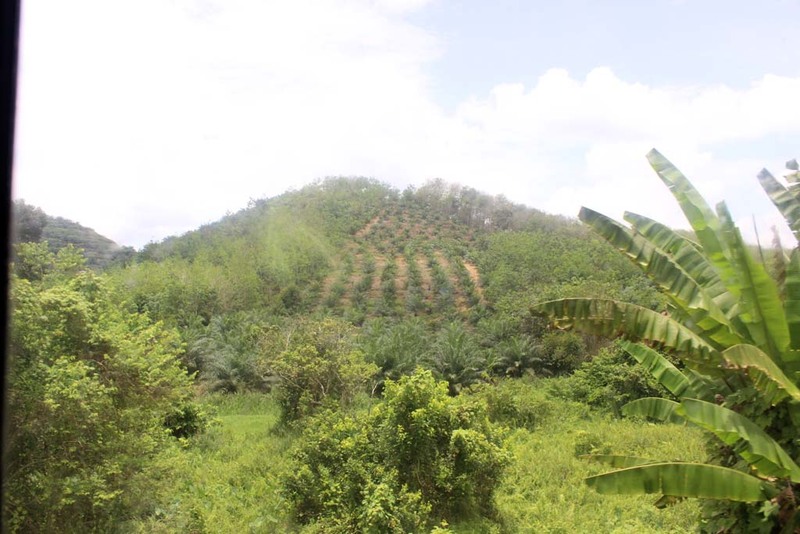 Between Bekok and Labis the landscape began to change as it became hilly. I don’t say it is scenic as it still dominated by palm trees, which rendered the scenery rather monotonous when seen from inside. 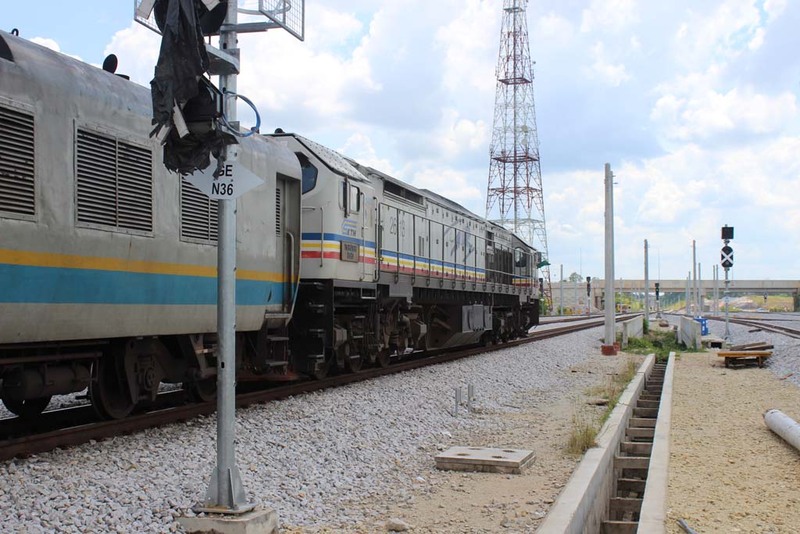 Yet, I believe that it could provide a good backdrop if I photograph the train from track side. 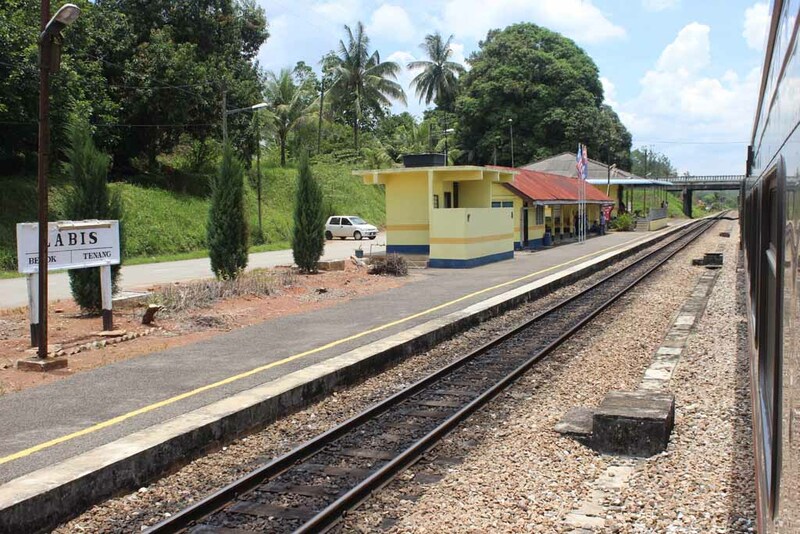 Our train finally arrived at Labis station. 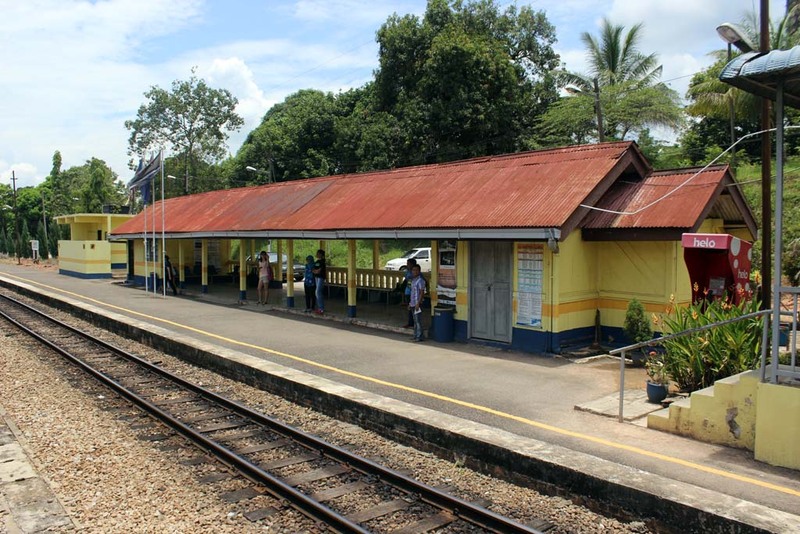 It is quite interesting that the old Labis station is more like a small wooden hut. The new Labis station looks small. 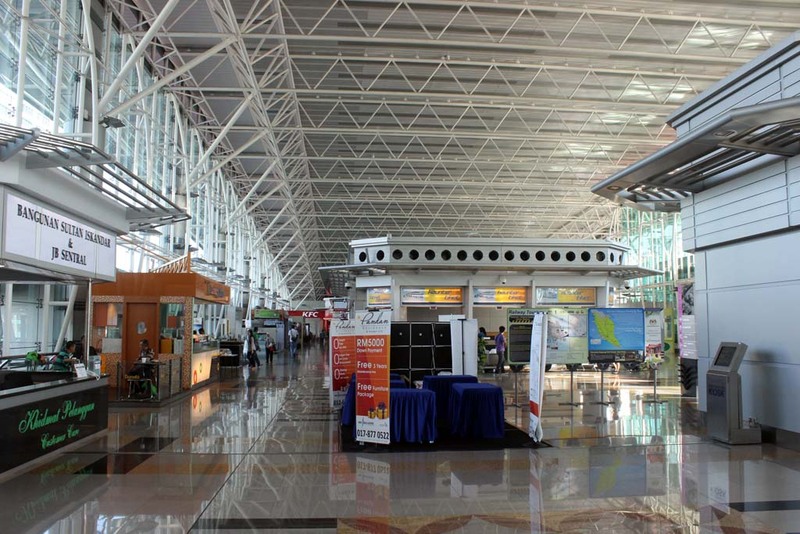 It might be more comfortable, but strangely it is smaller structure when compared to the previous station. 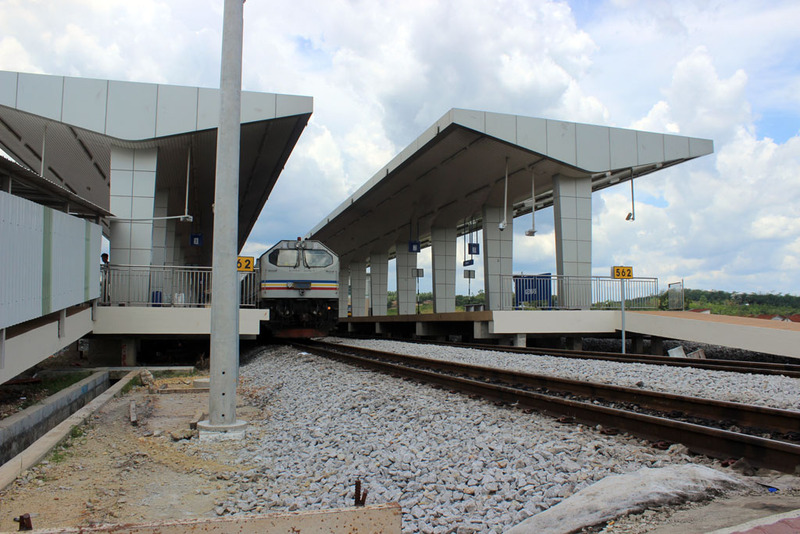 I couldn’t imagine how the future Labis station would have looked like if the double tracking project commence at the end 2013? 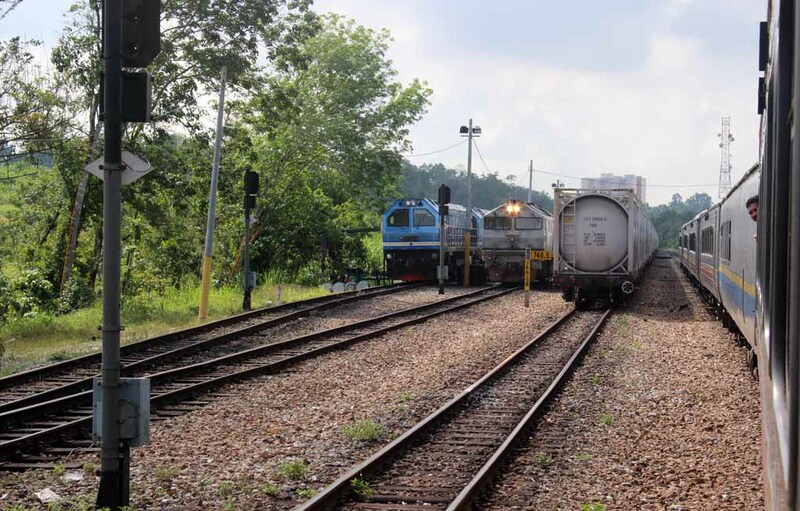 After lengthy wait, a train appeared in the distance, traveling on the opposite direction. 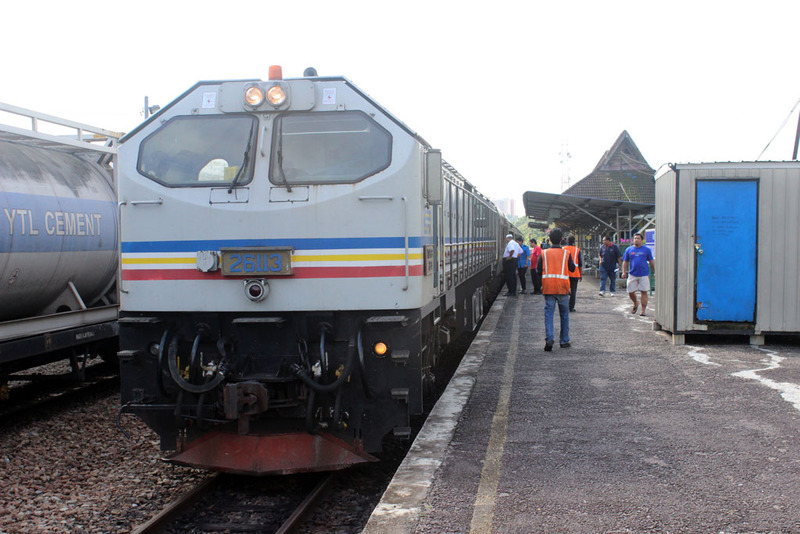 Apparently it is the southbound Sinaran Selatan, pulled by EMD built Class 25 locomotive. 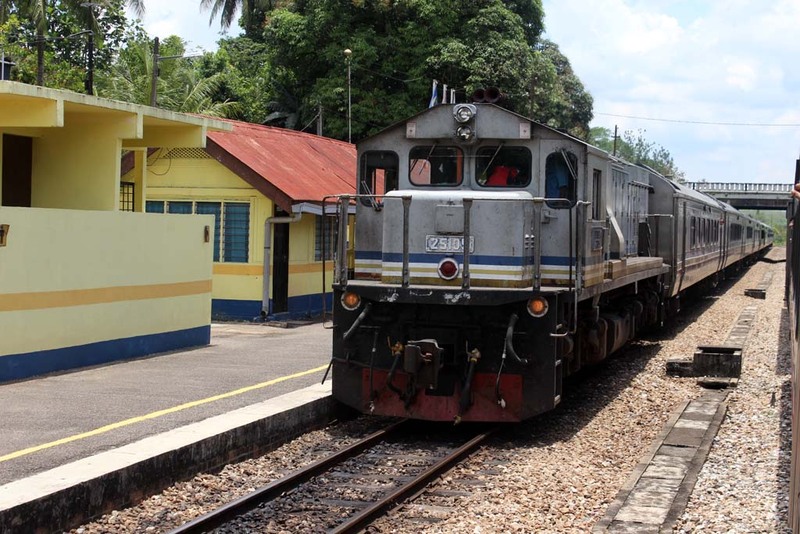 Despite of its small stature (and horsepower) the loco is well liked by KTM, so much that they ordered the locos twice! 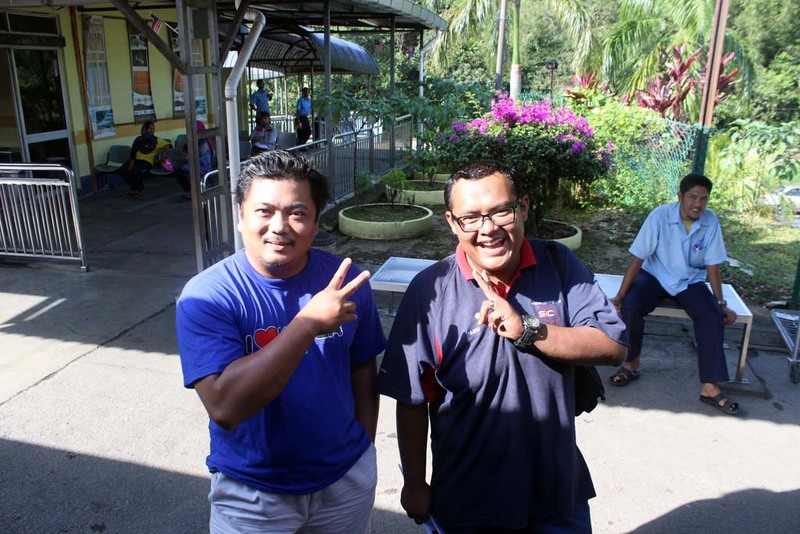 I manage to snap some picture between the coaches. 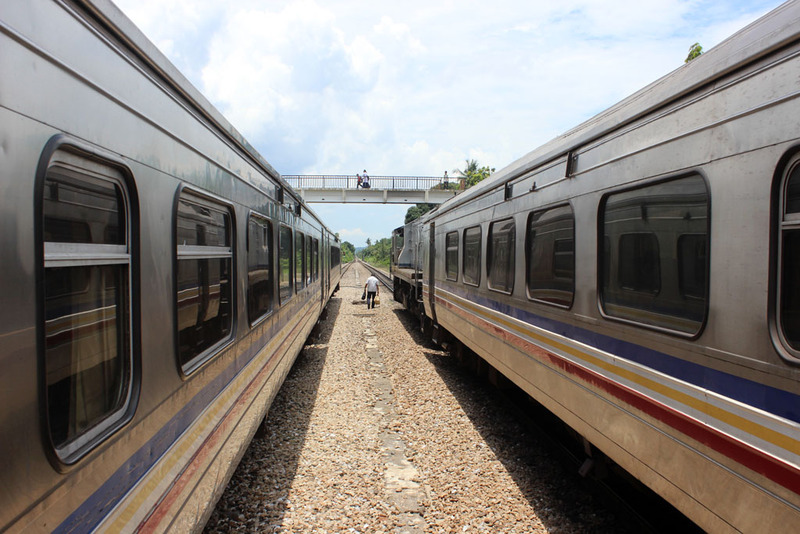 After the train resumed its journey, I walked around the short train. 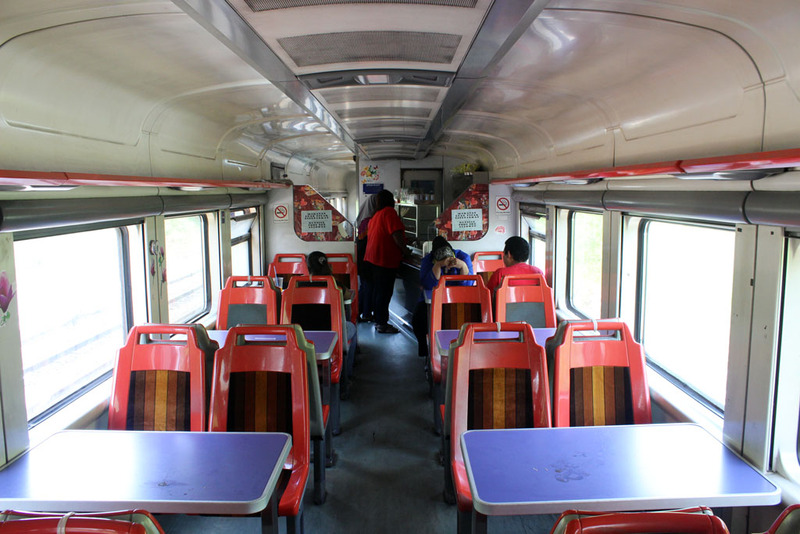 There are some irony about my train, when compared to the Singapore bound train that I took a few days ago, as this one feature buffet coach. I didn’t order anything as I already ate the Nasi Lemaks that I purchased at JB Sentral. So there is some irony about my train today. 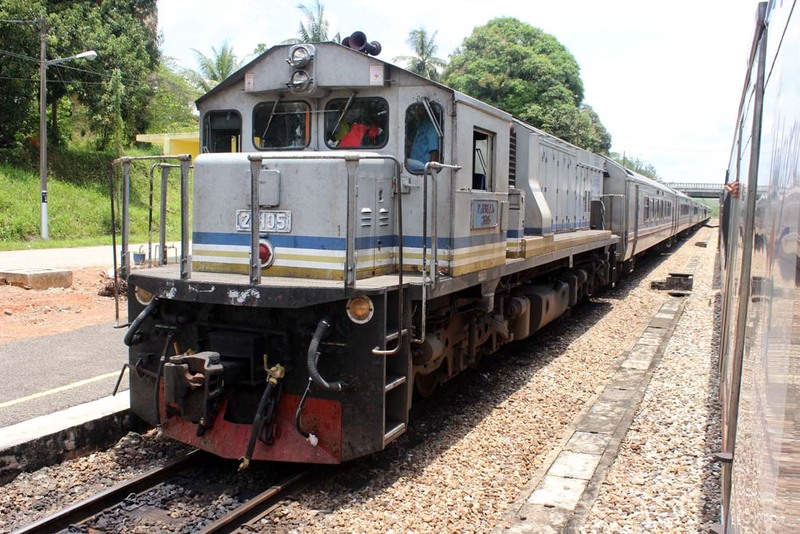 It is shorter and carrying fewer passengers when compared to the previous train that I took. 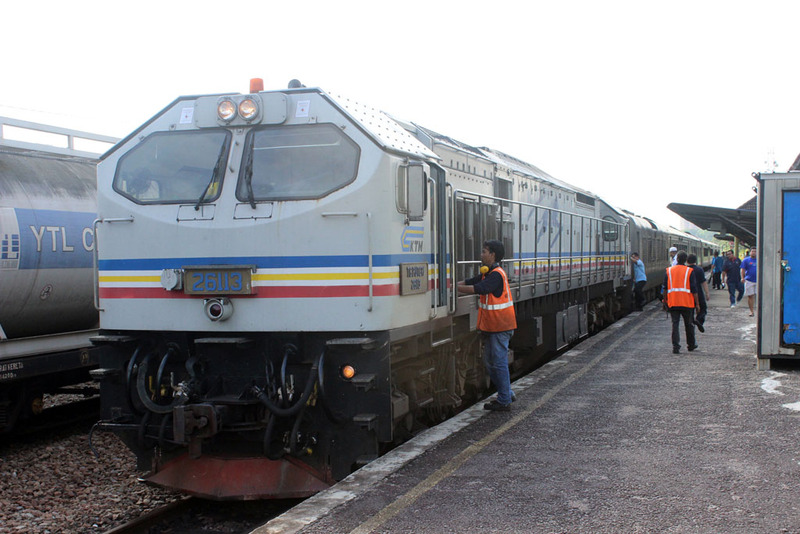 Yet it is hauled by twice larger locomotive, and it also has buffet coach attached. The Blue Tiger might looks nice, and despite of its size it could run at pretty high speed. But its behemoth size proved to be a problem, as it has to reduce its speed whenever it passed bridge that still have wooden sleepers on it. That adding times in our already late journey. 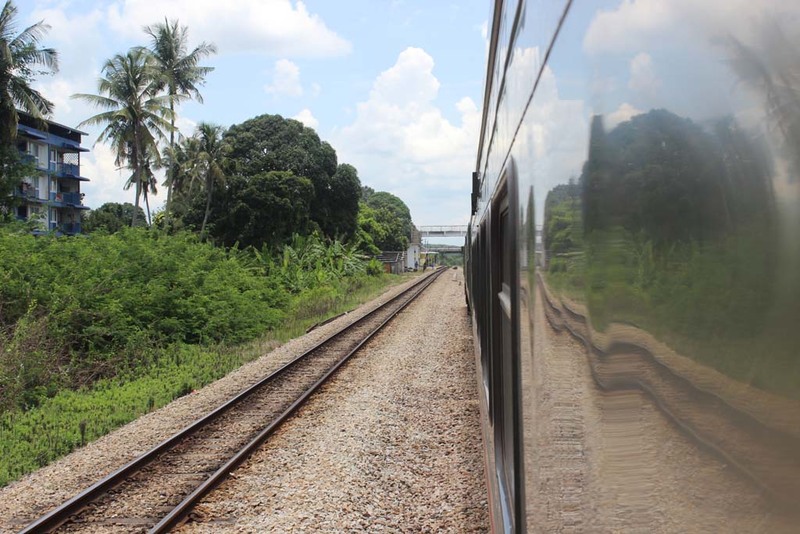 We’re nearing Gemas, where the view of savannah at Batu Anam beckons us. 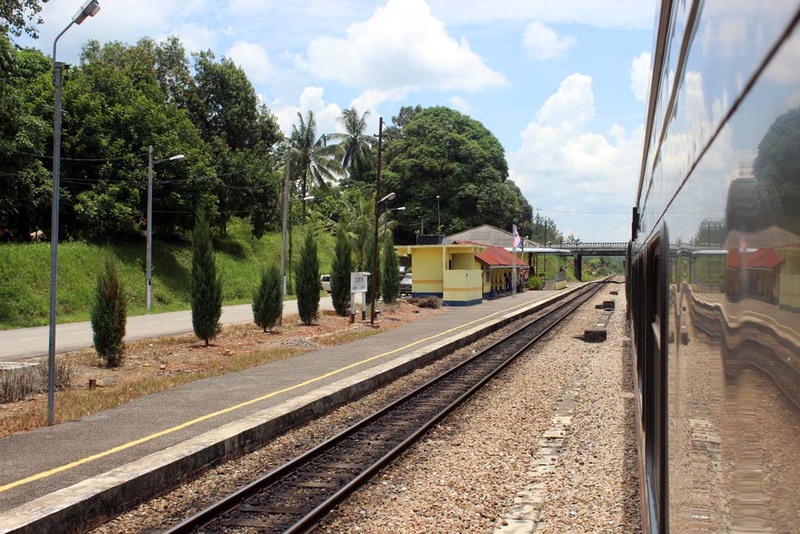 Finally our train arriving at Gemas station. 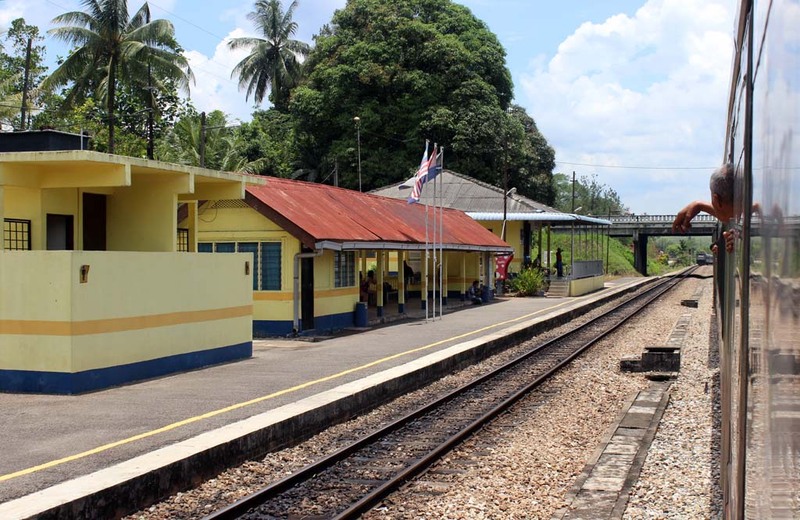 We disembark at this station, where we met bang Noor Harun, a friend of mine who worked as a train driver, based in Gemas. He wore white shirt in this picture. This is the first time I met him. Previously we had frequently chatted on the internet. Contrary to the previous journey, the driver in this occasion is quite friendly. I asked permission whether if I could take the cab picture. He allowed me for a brief visit. 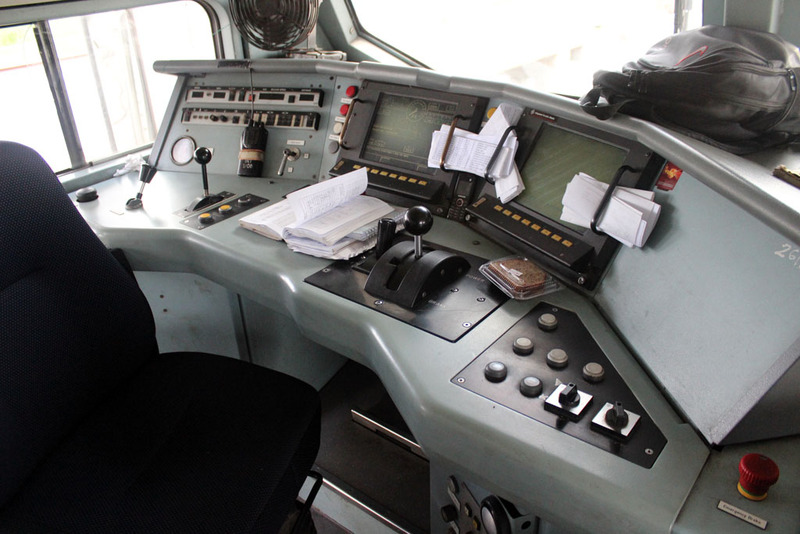 Once I entered the cab, I am quite stunned by how comfortable it is. 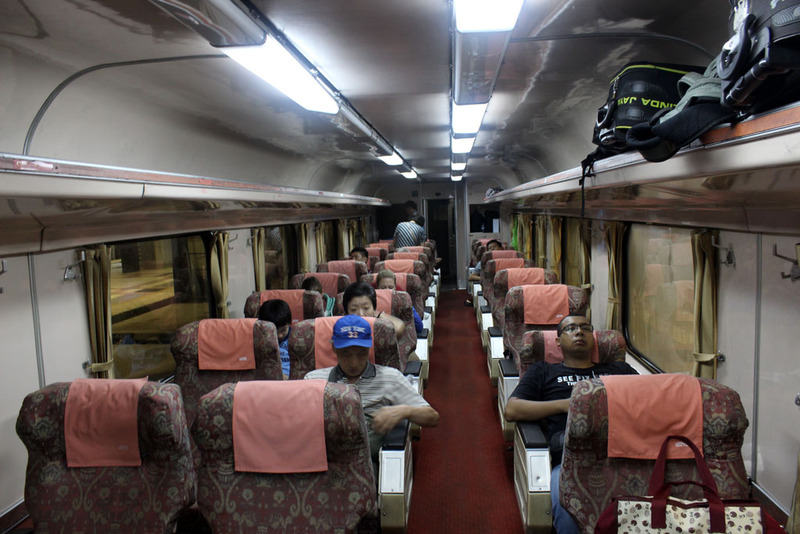 The driver who drove the train might felt really pampered in here. 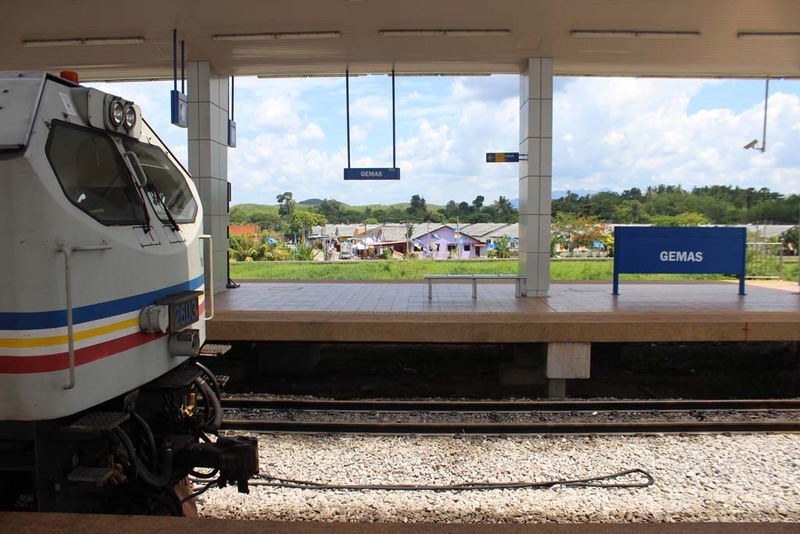 A few minutes later the train departed Gemas station. Bang Noor commented on how slow the driver is. 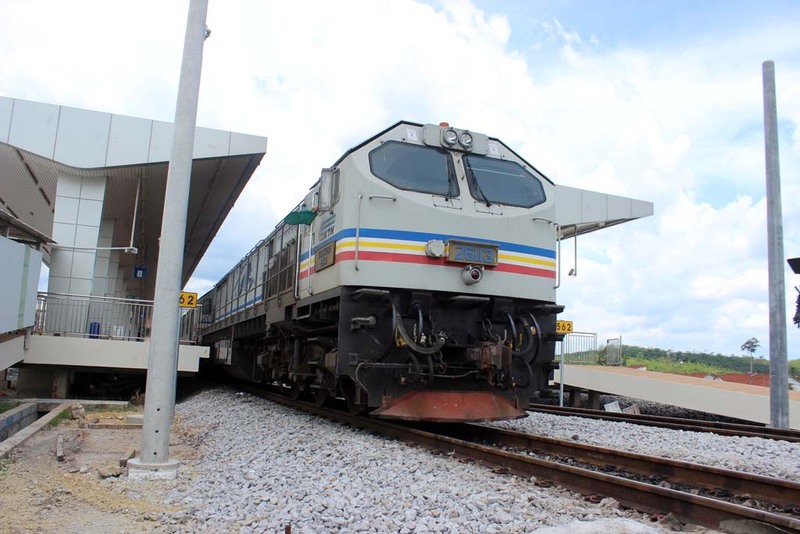 I can’t imagine how late the train will arrive at its final destination: Butterworth (still 7 hours away from Kuala Lumpur). 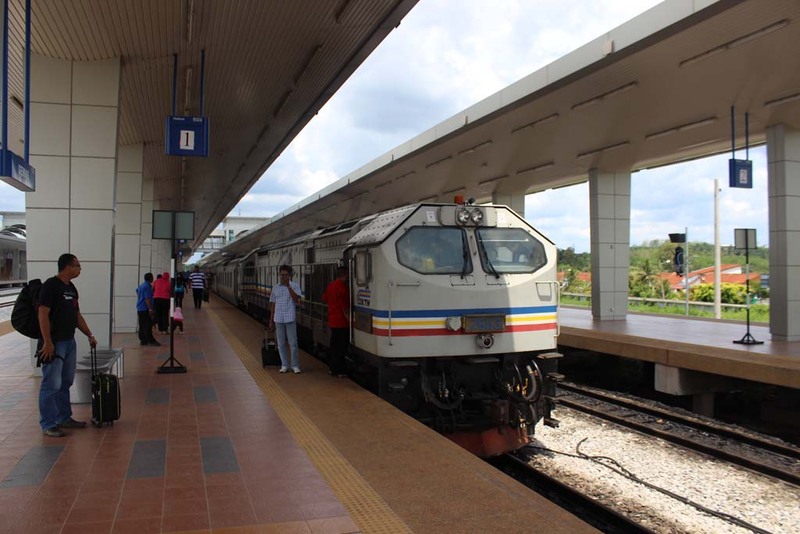 I believe that was Kluang Station. 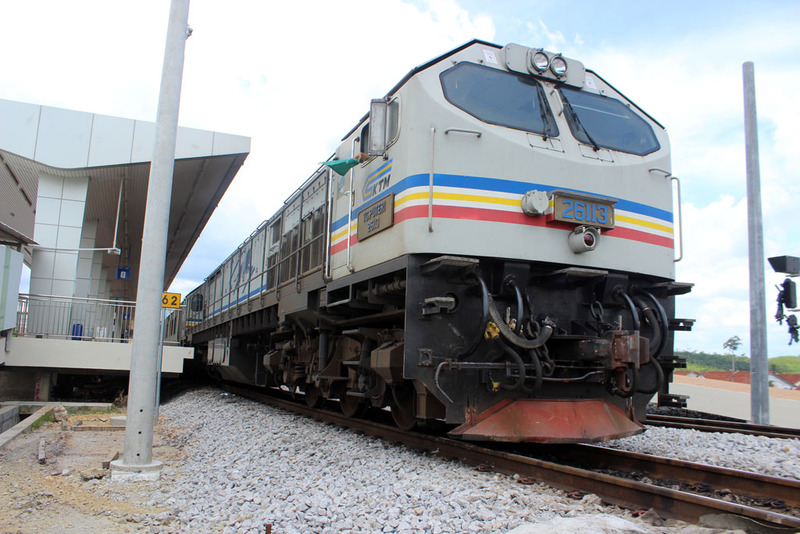 You’re lucky, Blue Tigers hasn’t pulled express train for a long time. There was an instruction forbiding BT from pulling express trains and do cargo works only sometime back.